Re: Comments on: "Coins issued by ISIL"
I will within a few weeks request the topic to be re-opened so I can update it and I will then also correct this mistake. Thank you for pointing this out. THE ORNAMENT UNDER THE LETTER "SIN" IN VALUE "KHAMSAT" APPRERS ON THE ORIGINAL WARRANT OF ISIS ON THE COIN OF 5 DINARS , SHOWN IN THE ATTACHMENT. Correct but the ornament was only included on the computer images that were published by ISIL. 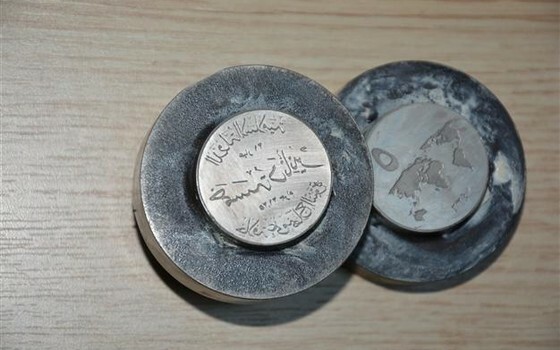 The 5 Dirhams coins of which the production was being shown in a propaganda video of ISIL did not have the ornament nor was it included on the dies used in the mint in Sahinbey. Are all of the images from the anti ISIL fighter on Numista? I still have to contact the guy, it is good to have some people on the ground who can report on the usage of these pieces. Who is anti ISL fighter? This guy: https://en.numista.com/echanges/profil.php?id=97143. That is where Gilad obtained his new photo above from which has a similar background to the images you show. Storing some images on WoC.. In 2015 the website http://www.isis-coins.com/ was launched. The website, which was hosted in Russia, depicted the name and logo of the Islamic State Finance House Board which was a new institution established a few months earlier by ISIL for the issuance of its coins. On the website people could buy a set of ISIL coins for 950 USD which had to be paid in Bitcoin. Although the website did warn for 'Chinese immitations' the pieces advertised on it looked exactly like pieces that are being sold by Chinese dealers and not like the pieces that could be seen in ISIL footage. An anonymous internet user did research on the Bitcoin address on the website and claimed it belonged to the German company World Islamic Mint. The World Islamic Mint was earlier behing attempts to re-introduce the dinar in other parts of the world. Shortly after this publication the website isis-coins.com was suddenly taken down. The exact same website was relaunched in 2017, though with a different Bitcoin address. In the meantime all of the pages about Bitcoin on the website of the World Islamic Mint were deleted. Although possible, it remains difficult to verify the information. What we do know however is that no payments were ever made to the 2 Bitcoin addresses. Early 2018 the website was suspended by its hosting provider. 1. Why did the issuance of the first series of ISIL coins not succeed? There only were reports of a few of the gold pieces, but the lower denominations were never reported as having been seen in circulation. All of that despite of the extensive local publicity campaigns on the radio, in mosques, by handing out flyers and large banners on the streets. 2. What are the pieces in this photo? The photo was published on April 30, 2015 on a now closed Twitter account of someone linked to ISIL. All of the pieces seem to be made of the same alloy and the dimensions of some of the pieces do not seem to match with the ones announced by ISIL. The lower denominations were never issued into circulation and this is the only photo on which their designs can be seen as minted coins. 3. Did the World Islamic Mint have a role in the introduction of the first series, and if so, which one? 4. Why was there decided for the issuance of a second newly-designed series and where was it produced?